Ishmael by Barbara Hambly. Library copy. Originally published in 1985. The Plot: As explained in my prior post on this crossover book, it's Star Trek meets Here Come the Brides. Spock winds up back in 1867 Seattle, has amnesia, meets the HCTB people. It has something to do with Klingons trying to do yadda yadda yadda....that doesn't matter. Nowhere in the book, including the book jacket and copyright page, is Here Come the Brides acknowledged or credited. In other words; if you don't know, you don't know. According to the Complete Starfleet Library, "This was not an officially sanctioned crossover; there was no mention of Here Come the Brides anywhere, and apparently nobody picked up on the author's joke until the book was published." What's better? That the editors didn't know HCTB, or that the editors knew and laughed and kept quiet about it? It's not the only crossover in the book. I KNOW. As I was reading, there was a description of someone that sounded like Doctor Who. And then later on, I'm like, huh, that sounds like Little Joe and Hoss. Know of other books that are crossovers like this? Let me know in the comments! Does original fanfiction count? 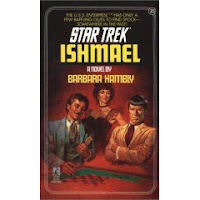 Hmm... Part of what I love about Ishmael is it is an official Star Trek book. But what the heck. If it's good, let me know. I had family members who've read this book gathered behind me reading this post. And, yes, someone ran into another room to pick Ishamael off a bookshelf. It is in front of me as I'm typing this. More crossover info is at http://www.pjfarmer.com/woldnewton/Spock.htm, but sadly there's no page numbers.